The CWS estimates the number of American workers in contingent and alternative arrangements as their main job. These are two separate categories. Contingent arrangements are short-term or temporary jobs; people surveyed expect them to end within a year. 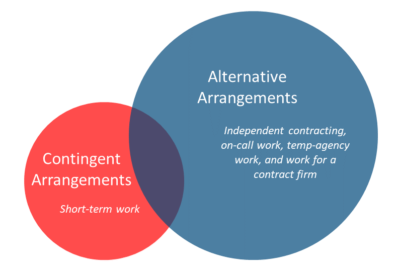 2Alternative arrangements are particular types of relationships between workers and the individual or company who pays them: independent contractors, temporary help agency workers, on-call workers, and workers provided by contract firms. What brings these categories together as “alternative” is that workers in all of them are not employed directly or regularly by the company at which they report to work on a daily basis. How many workers use online platforms like Uber, TaskRabbit, or Wag!? The CWS actually offers little insight here. We know from other data sources that many people who work on platforms do so on a supplemental or occasional basis,3and that there is high turnover among these workers.4Since the CWS only asks about workers’ main jobs in the past week, a lot of this work will not be reflected in the data released this week. The total number of contingent and alternative workers is not the only one that matters. We also need to look at the experience of these types of work. The CWS includes questions about workers’ access to health insurance and pension plans. Workers, regardless of their work arrangement, should have access to basic benefits and protections. In 2005, both contingent and alternative workers were less likely to access these benefits than other workers.5The updated numbers will highlight the needs of these workers for policymakers. Although we might not be able to draw conclusions about the economy as a whole from the CWS, we can identify where there are needs to improve economic security among workers. 1. See Upwork and Freelancers Union’s Freelancing in America and McKinsey Global Institute’s 2016 Independent Work report. 2. The BLS produces three different estimates of contingency: the first includes only wage and salary workers, the second includes wage/salary workers and independent contractors who have been in their job for less than a year and expect to work an additional year, and the third includes wage/salary workers who do not expect their job to last regardless of their current tenure and independent contractors from the second estimate. More information here. 3. See Thumbtack’s June 2018 A Positive View of the Future of Work report and McKinsey Global Institute’s 2016 Independent Work report. 4. See JPMorgan Chase Institute’s 2016 The Online Platform Economy report. 5. Other recent research has shown a similar pattern, including the SHED and Treasury Department analysis of tax records.